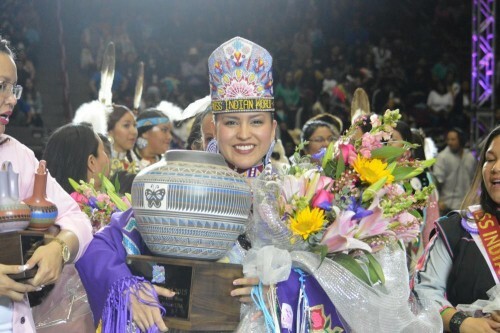 Cheyenne Brady, a member of the Sac and Fox tribe of North Dakota, was crowned Miss Indian World 2015 at the 32nd Gathering of Nations, which concluded Saturday night. The annual powwow is the largest event of its kind in the world, attracting more than 3,000 Native American and indigenous dancers from 700 tribes across the country, Canada and Mexico. The event also draws more about 100,000 spectators and nearly 800 Native American and indigenous artists and artisans. Judges selected Brady, 22, from a field of 21 Native American women who competed in such categories as tribal knowledge, dancing ability, public speaking and personality. Brady, a student at North Dakota State University, will travel around the world during the next year educating people about tribal culture and religion, as well as serve as a role model and ambassador of good will on behalf of all Native Americans. Ashley Pino, 25, from Acoma, N.M., a student at the University of California, Berkeley, was named first runner-up. She is a member of the Acoma, Santo Domingo and Northern Cheyenne tribes. The second runner-up was 25-year-old Baillie Redfern, from Ontario, Canada, a member of the Métis Nation and a student at the University of British Columbia. 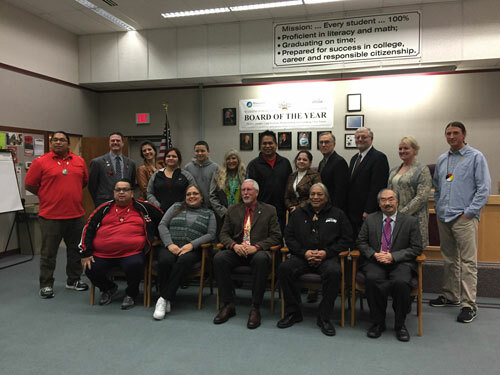 MARYSVILLE – The work to correct history began long before the Marysville School Board met on December 8, to vote on adopting accurate tribal history and culture via the Since Time Immemorial curriculum into their district schools. 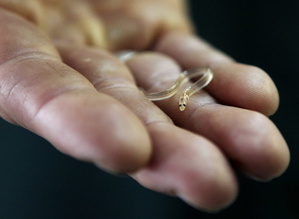 The idea was first introduced by then newly elected Rep., John McCoy (D-Tulalip), in HB 1495 on January 26, 2005. The bill proposed requiring school districts to offer tribal history and culture along with Washington State and United States history curriculum. It passed 78-18 in the House on March 9, 2005. However, since then school districts have lagged in offering accurate tribal history on the 29 federally recognized tribes located in Washington state. On December 8, MSD decided to unanimously pass adopting the Since Time Immemorial curriculum as part of required curriculum in all their schools. “This is awesome. This is a big district and to have a school board adopt it means a lot to us at the Native Office of Education, us as Indian people, and the people who created it. 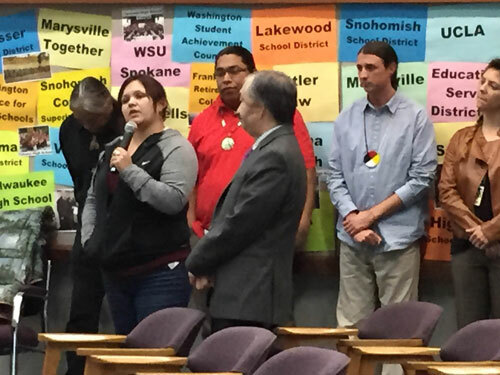 This is a great thing, because they are saying how important it is to start teaching about our history and our culture,” said Denny Hurtado, the outgoing Director of Washington Office of Native Education, following the vote. STI is the result of partnership between the State of Washington Office of Superintendent of Public Instruction, private and public agencies and several of the 29 federal recognized tribes in Washington state. The curriculum provides a basic framework of Indian history and understanding of sovereignty for grades k-12. Aligned with the Common Core standards for English, language and art, STI lessons can be adapted by teachers to reflect the specific histories of tribes in their local area. 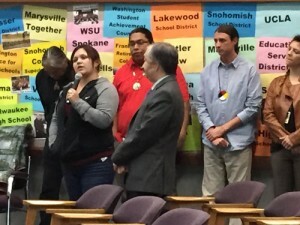 Teachers Shana Brown from the Seattle School District who is of Yakima dependency, Jerry Price, a middle school teacher with the Yelm School District and Elese Washines, an educator in the Yakima Nation Tribal schools, developed the curriculum under the leadership of Hurtado. STI was designed not just for non-Native students, but also for Native students. 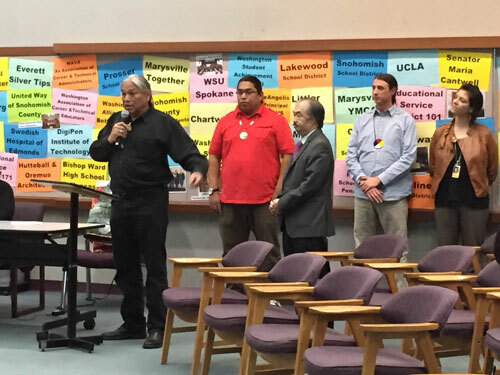 Its purpose, explained Hurtado to MSD board members, is to breakdown Native American stereotypes and misconceptions and to build bridges between tribal communities and non-Native communities. Over 1,000 teachers have received STI training by the Washington State Office of Native Education and 30 percent of school districts in Washington are using STI curriculum in some shape or form. Montana, Oregon and Alaska have also adopted STI curriculum in their school districts, and currently the Seattle School Board is looking into implementing it into their schools. 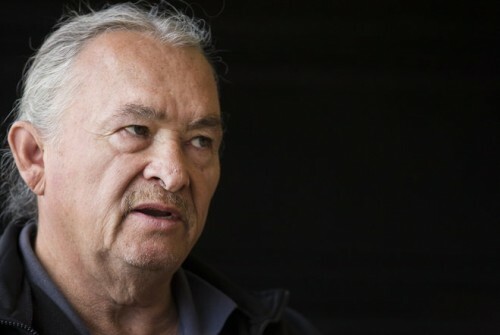 Matt Remle, a Lakota Native from the Standing Rock Reservation and Native American Liaison with MSD, who was present for the voting, said the change was long overdue. Fellow liaison, Eliza Davis, Tulalip tribal member, said the history of her own Tribe was lacking during her high school education. “I am excited for this day. I am excited about this and I am ready to approve this. We should have had this a long time ago,” said MSD board member Chris Nation right before the unanimous vote. For more information on STI, please visit the website www.indian-ed.org. The Challenges of Being Lost Inside Your Culture from BillMoyers.com on Vimeo. In an extended clip from this weekend’s Moyers & Company, writer Sherman Alexie, who was born on a Native American reservation, talks to Bill about feeling “lost and insignificant inside the larger culture,” and how his culture’s “lack of power” is illustrated in stereotypical sports mascots. Lately there has been a rise in the American Indian culture in the media. It’s possible, through their eyes that we have reached the time where the American Indian culture seems to be more of a legend than a thing which has evolved over time and is still around. Many different people, including the hoity-toity that have money to spend, are obtaining pieces of American Indian Artifacts. This February, the American Indian & Ethnographic Art auction grossed $1,777,912.50; this included the buyer’s premium, making it the most successful sale that the American Indian & Ethnographic Art department at Skinner, Inc. has ever experienced. Skinner, Inc. auctioneers and appraisers are located in Massachusetts and have been in the auction business for over forty years. Douglas Diehl, director of the American Indian & Ethnographic Art department at Skinner explained in a press release, “There is a definite resurgence in interest in rare and evocative American Indian art and artifacts and every category performed well across the board.” Bidders competed from the floor, by phone, and over the internet during the auction. Plains Indian Art was the highest lot bringing in $144,000. The item, a Plains pony beaded hide shirt which came from mid-19th century and had belonged to Eugene Burr. Coming with the shirt was an account of where and how Eugene had come to possess the item in. The Burr family traveled west along the Oregon Trail to Utah in 1855. Eugene’s father, David H. Burr, was appointed the first Surveyor General to the state of Utah. His father and his brother David traveled with him through Indian Territory and kept a diary of the journey. Eugene Burr died at the age of 17 in 1857; his initials are marked on the inside of the shirt. There were heated biddings on an assortment of hide cradles which raised the prices of other lots well above their pre-sale estimates. A pictorial Lakota cradle with a pre-sale estimate high of $35,000 sold for $78,000. A Cheyenne beaded hide cradle doubled its high estimate and sold for $30,750. Cradles from the collection of the late Joseph J. Rivera collection of Santa Fe’s Morning Star Gallery included a Kiowa model cradle, $57,000 and a classic Lakota beaded cradle for $33,600 – both exceeded pre-sale estimate highs. A Pawnee-style bear claw necklace made by Milford Chandler (1889-1981), $57,000. Two rare and beautiful Yupik Eskimo masks brought prices of $31,200 and $57,000. The first a mask showing a bird head on top of a circular human-like face and the second a face framed by stylized animal ears. Both said to be from Gustaf Osterberg, Chief mate on the US Coast and Geodetic Survey ship Yukon. Osterberg began making trips to the Alaskan coast in 1913. In 2011, a Navajo blanket dated to be from the early 1900’s went for over $200,000 in auction. Diehl said he “ realized the minute I first saw the weaving, with the variegated wool, the browns, all this great character, that this had to be a really early third phase Chief’s blanket.”, in his blog post about the blanket prior to it going up for auction. Some of us are wondering if this growing interest in the American Indian culture is a trend that will fade or is this a genuine curiosity and love of a culture which has evolved and grown over time.